Following the capture of Syria from the Ottoman Empire by Anglo-French forces in 1918, France received a mandate over this territory and separated out the region of Lebanon in 1920. France granted this area independence in 1943. A lengthy civil war (1975-1990) devastated the country, but Lebanon has since made progress toward rebuilding its political institutions. Under the Ta'if Accord - the blueprint for national reconciliation - the Lebanese established a more equitable political system, particularly by giving Muslims a greater voice in the political process while institutionalizing sectarian divisions in the government. Since the end of the war, Lebanon has conducted several successful elections. Most militias have been disbanded, with the exception of Hizballah, designated by the US State Department as a Foreign Terrorist Organization, and Palestinian militant groups. During Lebanon's civil war, the Arab League legitimized in the Ta'if Accord Syria's troop deployment, numbering about 16,000 based mainly east of Beirut and in the Bekaa Valley. Israel's withdrawal from southern Lebanon in May 2000 and the passage in September 2004 of UNSCR 1559 - a resolution calling for Syria to withdraw from Lebanon and end its interference in Lebanese affairs - encouraged some Lebanese groups to demand that Syria withdraw its forces as well. The assassination of former Prime Minister Rafiq HARIRI and 22 others in February 2005 led to massive demonstrations in Beirut against the Syrian presence ("the Cedar Revolution"), and Syria withdrew the remainder of its military forces in April 2005. In May-June 2005, Lebanon held its first legislative elections since the end of the civil war free of foreign interference, handing a majority to the bloc led by Saad HARIRI, the slain prime minister's son. In July 2006, Hizballah kidnapped two Israeli soldiers leading to a 34-day conflict with Israel in which approximately 1,200 Lebanese civilians were killed. UNSCR 1701 ended the war in August 2006, and Lebanese Armed Forces (LAF) deployed throughout the country for the first time in decades, charged with securing Lebanon's borders against weapons smuggling and maintaining a weapons-free zone in south Lebanon with the help of the UN Interim Force in Lebanon (UNIFIL). The LAF in May-September 2007 battled Sunni extremist group Fatah al-Islam in the Nahr al-Barid Palestinian refugee camp, winning a decisive victory, but destroying the camp and displacing 30,000 Palestinian residents. Lebanese politicians in November 2007 were unable to agree on a successor to Emile LAHUD when he stepped down as president, creating a political vacuum until the election of Army Commander Michel SULAYMAN in May 2008 and the formation of a new unity government in July 2008. 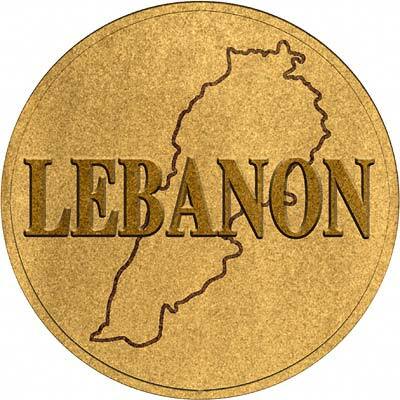 For silver and base metal coins of the Lebanon, please look at our original Chard Coins website. We make an active market in almost all world coins, gold or otherwise, including Lebanese gold coins. If you have any of these coins to sell, please contact us, or post them to us for appraisal and offer.